On Wednesday’s Fox & Friends, co-host Steve Doocy took strong exception to the NAACP’s claim it was “snookered” by Fox News into denouncing former Agriculture Department official Shirley Sherrod based on excerpts of a speech she delivered at a dinner in March. “There’s a timeline problem,” Doocy pointed out, noting that the NAACP had on Monday night denounced Sherrod as “shameful,” the same day that she was pressured to quit her job (she says by the White House). But Fox News never mentioned the story until after Sherrod had quit. “So for anybody to say that Fox News pressured her out, that is simply a lie,” Doocy asserted. The liberal media have gone from largely ignoring the Sherrod story on Monday night and Tuesday morning to embracing it as a case of a woman maligned by an unfairly edited video clip. But if Sherrod is indeed the victim, much of the damage seems to have been caused by the precipitous reaction of the NAACP and the Obama administration — not liberals’ favorite target, Fox News. 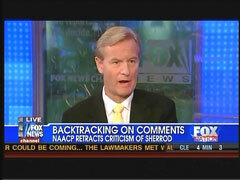 Co-host STEVE DOOCY: The NAACP has done, essentially, a double-back flip. First, here's what she said regarding the NAACP: [Words on screen] "They got into a fight with the Tea Party, and all of this came out as a result of that." 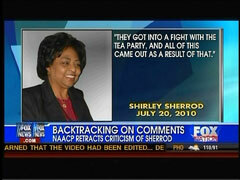 But here's what she says about the NAACP, she says, she blames them for her getting in trouble. Now, here's what the NAACP said on Monday night — on Monday night, as soon as the news had hit the fan. They said [reading] "her actions were shameful. While she went on to explain in the story that she ultimately realized her mistake, as well as the common predicaments working with people of all races, she gave no indication she had attempted to right the wrong she had done to this man." That was on Monday. Then yesterday, the NAACP came out and they said that we're now apologizing to her and they say they were snookered by Fox News and Andrew Breitbart. But as [fill-in co-host] Dana [Perino] mentioned, there's a timeline problem. Fox News did not do the story until after she had already resigned. So she was pressured by the Department of Agriculture to quit. She quit. And then we did the stories. So for anybody to say that Fox News pressured her out, that is simply a lie.